The defense sector is on fire. Here's how to play the best of the best. A number of the defense/aerospace stocks have been on fire of late; the sector has been moving extremely well since the election. The ITA (iShares U.S. Aerospace & Defense Index Fund) is up more than 20% from the 2016 close and up just under 30% since the election. In the current environment, it's very likely this sector will continue to attract interest. The top companies in the group could have quite a bit more upside through year-end. This stock stalled a bit immediately after its last earnings report in mid-July, but the name has been on fire so far in August. Prior to Thursday's slight setback, the stock was on a nine-day winning streak, a run that lifted shares 7%. Despite this impressive run, LMT remains below overbought readings but is a bit stretched by historical standards. A consolidation may be ahead, in the form of a tight bullish pennant or flag, before the current rally can continue. Support is on pace near the $300.00 area. A much more solid support zone is in place between $294.00 and $293.00. This area includes the July high as well as the spike high reached on July 18. A dip this deep may be too much to ask for, though. LMT is a B rated stock. This stock's move has been even more impressive. Raytheon has stretched its gain off the July lows to more than 12% from last month's low and is now entering overbought territory. 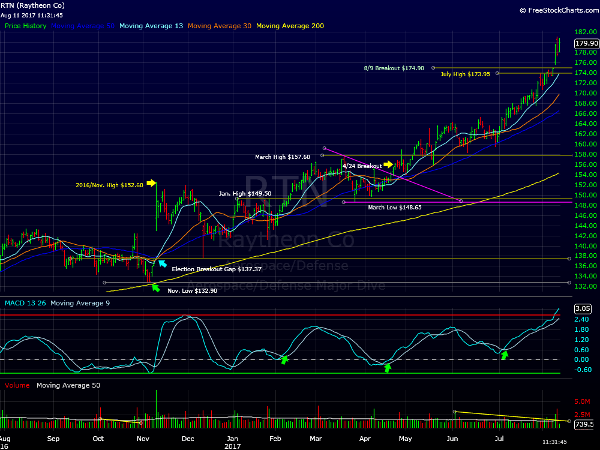 In the near term, it's likely that RTN will consolidate before its powerful bull run continues. The stock has a solid support zone in place near $174. A dip to this area would offer a very low risk entry opportunity for patient bulls. RTN is an A-rated stock. Northrop has been a bit of a laggard when compared to RTN and LMT. The stock is up only 6% from the July bottom but has had a steady run overall. 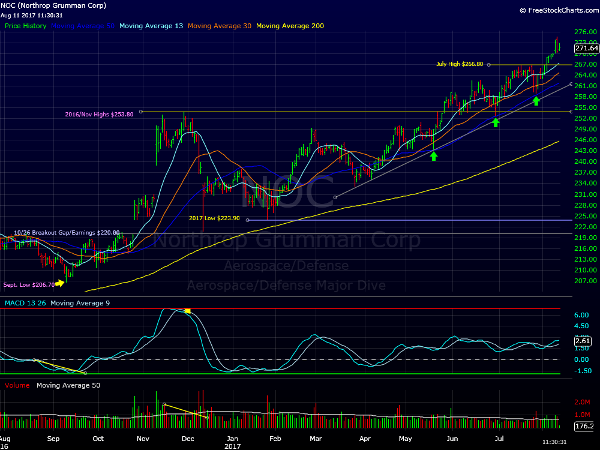 A slight pullback for NOC would retest a key support area near the June/July highs. This zone runs from $267.00 to $263.00. NOC is also an A rated stock. 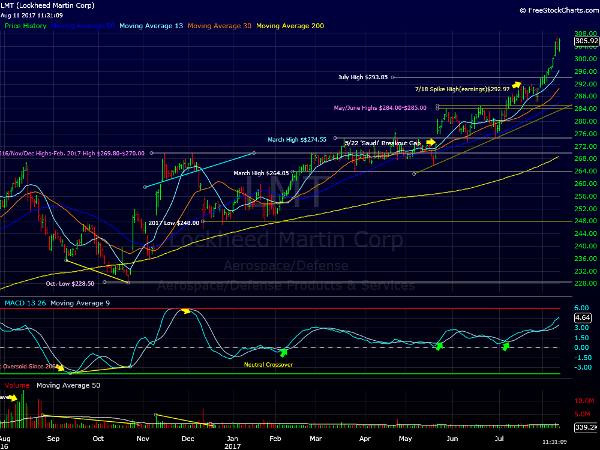 Overall, the defense sector remains in a powerful bull rally. The top names mentioned above should be viewed positively and considered buys on weakness. It would take quite a stunning reversal to inflict damage on this group. Editors' pick: Originally published August 11. At the time of publication, the author was long RTN and LMT.